We have been handling break-bulk and bulk cargoes in Iraq on behalf of Charterers and Ship owners. We represent reputed global shipping companies with regular import cargoes from USA, Europe, Black Sea, China, Far East, South East Asia and Indian Subcontinent. 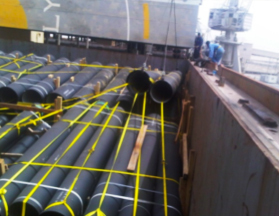 Regularly handling break-bulk/multipurpose carriers and project cargo carriers operating to and from the Middle East. Our regional and local experience helps us to add value for our business associates, principals and customers. Our staff is well trained and capable to deal with any kind of issue related to Break-Bulk Cargo. Our optimally reliable Break-Bulk Services are offered on very genuine rates.